You are currently browsing the Collector Model blog archives for February, 2013. 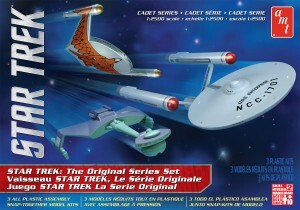 We were proud to finally release the 1:350 scale ST:TOS U.S.S. Enterprise late last year. Expecting that many modelers would want to take their kit to the next level by installing lights, we offered two products featuring a light kit specifically engineered for the kit, MKA005 Deluxe Accessory Set and MKA007 Light Kit. Offer this kind of product was a first for us, and a few hiccups have been reported along the way. The primary complaint has been about the round PCB boards that go inside the Bussard collectors. We would like to take this time to review the problems and solutions. Problem #1- Round (Bussard) PCB boards either fail from the beginning or perform correctly initially, but fail in whole or in part soon after. We apologize for any frustration this might have caused. All boards were tested twice before being packed to ensure all lights came on and worked properly. Due to all of the possible variables, it has been difficult to diagnose the source of the problem. We have not been able to reproduce these results in our own testing. With this in mind, we will honor requests to replace the boards through our normal part replacement service via the link located at the bottom of our website. In addition to the proof of purchase, we are asking for all failing boards to be returned when sending your replacement form. These faulty boards will be returned to our factory for further examination. If you have not yet assembled your kit and installed the light kit, please keep this in mind. The heat shrink casing mentioned in the instructions of the light kits was omitted by the factory. We will mail this to anyone that requests it, but common electrical tape (or wire nuts or any other common electrical wire insulating method) can be used. In all cases, be sure to properly insulate (with tape or heat shrink casing, etc.) all splices, especially those that connect the round PCBs to the rest of the system. This must be done to prevent raw wires from touching which would cause the PCB to short out. This is very important to do to ensure the lights will work once your model is complete. Further, if you are testing the boards or system before final assembly, make sure not to let any exposed wires or un-insulated splices touch while the power is on. Failure to do this may cause the boards and/or LED bulbs to short and destroy the system. 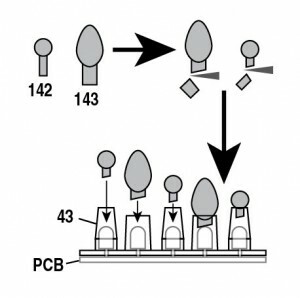 Problem #2- LED bulbs installed on PCB boards stand on their leads rather than being properly mounted flush to the board. This prevents proper assembly of the Bussard collector. We apologize for any frustration this may have caused as well. All samples reviewed up until final production showed that all bulbs were properly mounted to the boards. This was a problem that occurred during production. Though they were all inspected twice for their functionality, they impact on the assembly was not foreseen by the factory. If the parts have not been cemented together there is an easy modification that can be made to the clear bulb parts included in the kits that will solve this problem. Simply clip off 2mm from the pin on each bulb (plastic parts 142 & 143). The remaining section of pin will be enough to cement them into part 42 and allow enough clearance to accept the extra length of the LED bulbs. If these parts have been securely cemented together, we will either replace the bad board, or we will replace all colored clear bulbs and part 142 to allow you to make the above modification for use on your model. Lastly, We have gotten multiple complaints about two more problems with plastic kit parts in the POL880 (1:350 scale TOS Enterprise) and POL878 (Premiere Edition) kits themselves. The most well-known is the problem with bent or warped shafts on the fan blade dome (part #140). For people building their kits without lights, this shouldn’t be a huge concern. We have replacement parts available for anyone that runs into this problem. We had the tooling modified to fix this problem as soon as we heard about it. So future production of the kit should not have the same concern. The other problem is that we have gotten several requests to replace pylon parts due to warping. However, we have not been shown examples where warping is so severe that replacement of the parts is warranted. 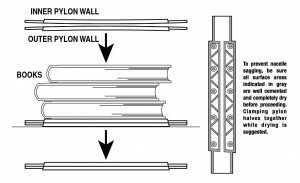 We have found that cementing the long edges of both parts and placing these sub-assemblies under a significant weight such as a stack of books will eliminate warping in the final subassembly. Allowing the parts to dry under weight will ensure they will stay straight. If you think you have a such a significant amount of warping that you feel it can not be corrected, please use the “contact us” link on our website and we will respond to see photos of your parts to judge these extreme cases. For anyone finding a problem with their kit (be it the 1:350 Enterprise or any other kit we offer) please note the part replacement guidelines on our website. Replacement part requests are addressed almost daily, and they are usually shipped within two weeks or less. Let the Kat out of the box! What could be better in the winter months than enjoying time at your modeling workbench, jammin’ on your latest and greatest build? Finding a Katch the Kat version of AMT’s upcoming “Sock It To Me” 1962 Chevrolet Corvette kit, that’s what! The Kats are at it again, getting ready to reissue a perennial favorite kit, in the most desirable format ever seen in its history: SOCK IT TO ME! Back in the day, the original AMT Kats cleverly created issues of select kits named after popular catch phrases of the time. The “Sock It To Me” ’62 ‘Vette oozed additional coolness, with it’s psychedelic “airbrushed and pinstriped” box artwork and fluorescent orange lettering. The FOUR different mod car illustrations on the box made you want to build one, or more, “real bad!” As a special bonus, inside the kit was a bonus Sock It To Me bonus sticker, printed with day-glo ink. The model could be built as a sporty stock replica, but also included a myriad of performance parts to create several different inspiring custom and racing variants: a blown quarter miler, a DOUBLE-blown salt flats rocket, or a totally mod custom with mind-blowing pinstripe and flame decals! Dig? Dig!! When the Kats decided to reissue the kit in the SITM packaging, they went all out, making sure it was just as sweet as the original… even better! They’ve included pad-printed “pie crust” M&H Racemaster slicks along with “wide whitewall” Firestone Deluxe Champion tires. They even restored the vintage slotted Astro mags back to their original appearance by adding back the textured center sections, for the ultimate in retro realism. The super-colorful decal sheet has been completely recreated from scratch, and we think you’ll agree, they are beautifully brighter than the originals! The Kats like the feature-packed ’62 Vette kit so much, they’ve decided to include it in the exclusive “Katch the Kat” program. Just like the Meyers Manx and Grandpa Munsters’ Drag-U-La, one in every twelve Sock It To Me ’62 Vette kits is molded in a special metallic color. Every metallic kit includes a confirmation card inside the box to let you know you’ve found something special! This time, and in keeping with the groovy box art, the metallic color is far-out orange! But every kit, whether it’s molded in white or metallic orange, includes a reproduction bonus “Sock It To Me” sticker, just like the original. It’s fabulous fun – only from the Kats at AMT! 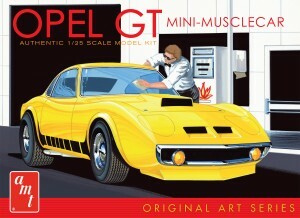 Round 2 is offering several popular 1:25 scale models in 2 colors. The series began with the Silver Screen edition 1957 Plymouth Belvedere – “Christine” available in Red or White. The newest release is the AMT Buick Opel molded in your choice of White or Yellow. Includes 9×12 frameable print, large format Original Art Series packaging featuring vintage painting from AMT archives, all new and expanded decal sheets, and 3 hood options allow for the car to be built drag, custom, or stock. Be sure to watch for the final car in this series a ’67 Shelby in Black or White.